A fun and harmonious beginner’s introduction to the Art of Tea … with sweets! Ms. Midori is kind, easy-to-follow teacher, as well as an accomplished actress! To many, there is nothing more iconic and attractive — or perhaps intimidating — than the Japanese Tea Ceremony. 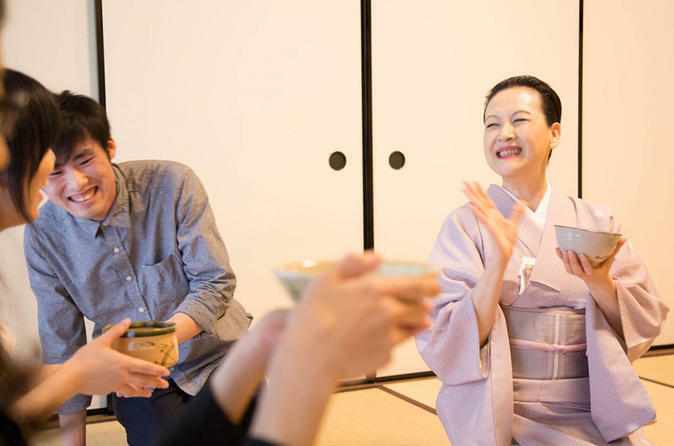 In this authentic tea ceremony experience, interested beginners can learn the Art of Tea in true Japanese style (In Japanese or simple English). In the beautiful surroundings of a traditional tea room, you will discover the deep, tranquil enjoyment of the Japanese tea ceremony, and garner a rich understanding of the Japanese mind and culture that created it. Relaxing and informal, this tea ceremony experience will help you to create truly unique and lasting memories of your time in Japan as you discover the full, rich enjoyment that the Art of Tea can bring. You will learn to make and enjoy tea in the traditional way, and there will also be plenty of delicious Japanese sweets to enjoy along with it! Treat yourself to an immersive, fascinating, and fun cultural experience, and invite the warmth and pleasure of the Tea Ceremony into your life.